Recent advances in ecosystem service modeling focus on linking ecosystem service delivery, their associated values and trade-offs across services (e.g. Integrated Valuation of Ecosystem Services and Trade-offs InVEST, and Artifical Intelligence for Ecosystem Services ARIES). Bastian et al (2011) made a clear distinction between potential supply of ecosystem services (based on the natural capacity of an ecosystem), and the actual delivery. first level trade-offs are generated by the biophysical potential of the ecosystem to deliver the different services (e.g. marshes have a higher capacity to provide biodiversity than deep water habitats); second-level trade-offs refer to the actual delivery within the study area, capturing biophysical potential trade-offs as well as land use and management based trade-offs (e.g. choosing to graze marshes determines which potential services are more and less delivered: food provision, biodiversity, carbon storage, etc.) and third-level trade-offs concern the final provision to society, depending on demand, accessibility, ecosystem service flow and generation of benefits (e.g. is the food actually sold, is the marsh accessed for recreation). Knowledge about first-level trade-offs is essential to avoid unrealistic optimization scenarios. As the TIDE approach remains restricted to habitat surface measurement, the entire functional process and structural background of these trade-offs cannot yet be captured. However, conflicts between different uses (and services) da actually follow from the high demand for different services on a limited surface (see report “Conflict Matrices: Comparisons For TIDE Estuaries ”). A trade-off risk indicator derived from the habitat supply data is therefore a useful tool to explore potential trade-offs and synergies between services. The higher this number, the bigger the total difference in habitat supply distribution, and thus the higher the trade-off risk when management measures affect habitat surfaces. Table 6: Potential trade-offs and synergies between ES (0: synergy / 3: very high trade-off risk). This analysis is based on the supply functions of the habitats. Each score presents the average of differences in supply score (1-5) per habitat. 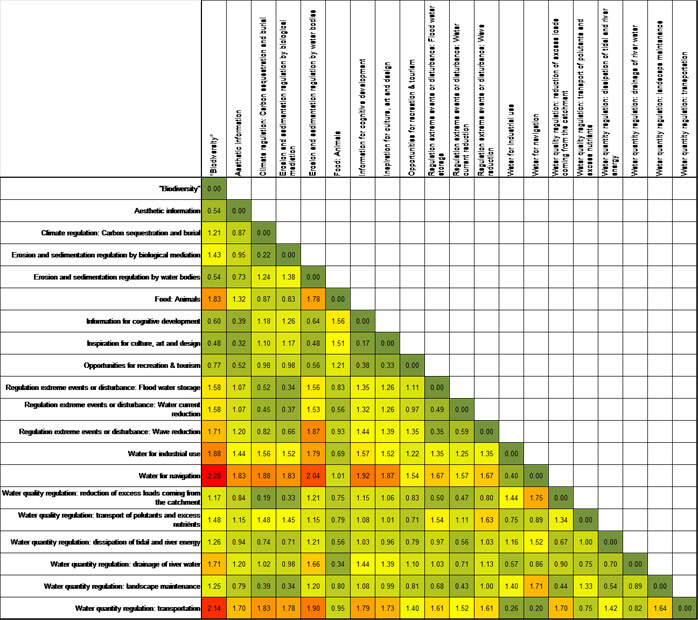 The trade-off risk analysis (Table 6) situates the highest risks with supporting services (“biodiversity”), exhibiting high trade-off risks with provisioning services and water quantity regulating services. These same provisioning and water quantity regulating services exhibit trade-off risks with regulation of sedimentation-erosion and extreme events or disturbance. Synergies are mostly found among services within the same group (eg cultural services, regulation of extreme events or disturbance,…). In practice these trade-offs might not be apparent (as second level trade-offs) for instance where an adequate amount of provisioning deep water habitat is present without impacting supply by other habitats. Comparison with the inventory of conflicts between direct uses (“Conf lict Matrices: Comparisons For TIDE Estuaries”) reveals large similarities with this trade-off risk indicator. For instance, potential trade-offs occur between supporting / habitat services (“biodiversity”), sedimentation-erosion regulation, prevention of extreme events and disturbance on the one hand and provisioning and regulating services related to industrial use on the other hand. This is also reflected in the conflict matrix. However, many potential synergies occur between (sets of) regulating services, cultural services and biodiversity. Assessment of the trade-off risk is an important tool to capture potential conflicts of ‘direct uses’ (e.g. shipping, recreation, see “Conflict Matric es: Comparisons For TIDE Estuaries”) with the many non-use services (regulating services, supporting and habitat services). These essential services are rarely represented by stakeholders but can severely affect long-term use of the estuary, and therefore should be taken into account in management decisions. This trade-off risk assessment provides a useful screening to guide a localized trade-off analysis, aiming at conserving/restoring/compensating supply of all services and securing long-term multi-functional use of the estuary.